Background: Dedri Uys is the mother of CALs with her revolutionary Sophie’s Universe from back in 2015. This year, 2018, Scheepjes CAL is once again designed by Dedri in the beautiful form of The Ubuntu blanket. It was in a remote little empty coffee shop in London drinking lattes and cappuccinos, chatting about highs and lows, that Dedri first revealed her upcoming CAL to me. The conversation quickly snowed in on talking about CALs and the excitement this new one would bring. So to say that SistersInStitch jumped on the chance to test the pattern is giving it to you lightly. Both of us, me and Tess, had started off this crocheting adventure with a CAL, the same one even, “In Bloom CAL” by Mijocrochet, and it was one of those things that brought us together in the first place. Both of us had worked on Sophies Universe and simply loved crocheting Dedris patterns. Now we were given the opportunity to test a pattern together and it really felt as we had come full circle. FINALLY the Ubuntu CAL has begun and we can now share what we have been holding close to our heart for such a long time! 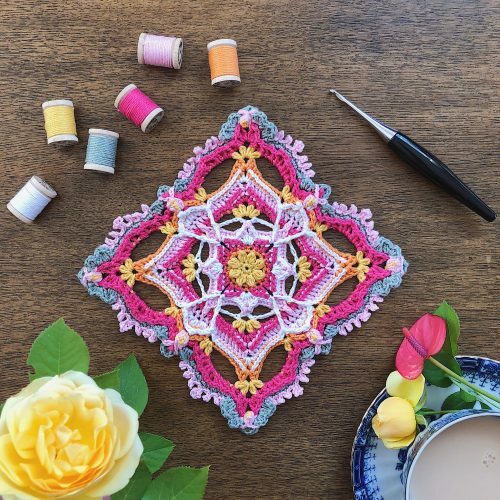 It has been such a joy and it’s going to be so much fun seeing all corners of the world joining together in this amazing crochet adventure that is The Ubuntu CAL. Oh, and PS. Don’t forget to use the official hashtag #ScheepjesUbuntuCAL if you wish to share your Ubuntu journey on Instagram and Facebook, that’s how we can all find each other.